I've been a fan of Kan Kick since discovering his work back in '01. It took me a couple years before I actually heard anything of his, but I knew the name. In '99, it wasn't hard being aware of Kan's name if you were a Lootpack fan, you just had to listen closely to their records. Clearly, there was somebody part of the crew that they kept hyping and probably worth further investigation. At the time I felt, "If Madlib's championing this guy, it's got to be good." Fast forward two years and I land a copy of Kan Kick's under the radar west coast classic, "From Artz Unknown". A beautiful debut and essential for any true hip-hop fan. On first listen, you heard what should have been a household name for underground hip-hop. Unfortunately to this day, I've been dumbfounded on how overlooked his production has been. Speaking with other artists, producers, fans, I've taken some satisfaction that maybe my assumption of this criminally slept-on producer isn't true. Because not only are they very aware of his work, they all end up feeling exactly the same way I do. It's like people I talk to about Kan have a personal connection to his music. They're thrilled to finally talk about him and the energy in their voices raises. There are very few producers that give you goosebumps when you listen to their music, Kan Kick can do that to you. I met Kan Kick in 2003 and asked if he'd come on my newly founded show, he didn't hesitate to say "Let's make it happen." With a less desirable DJ setup, busted needles and dusty records, we pulled off what I consider the birth of BTS Radio. The first official BTS show and the one that makes me the most proud. Charles Munka told me, "This is the re-launch, put up the first show. Show them where it all started." Makes sense. 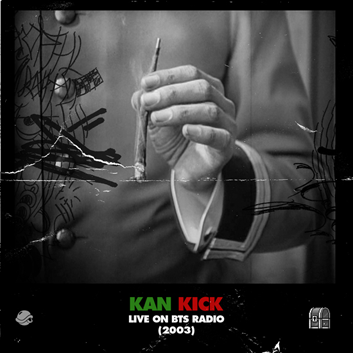 This download includes the original live recording, plus a segment never before before heard of Kan Kick presenting some exclusive productions strictly for BTS. I'll end this with a tweet I read from frequent Kan Kick collaborator, MC Blame One. "Y'all gotta realize that Kan Kick is a legendary producer...If you know about Madlib and Oh No, you should know about Kan Kick. Period."